I am working on a .NET project with, which started out as a prototype that now has to scale. We have the ASP.NET MVC stack with Entity Framework (code first). 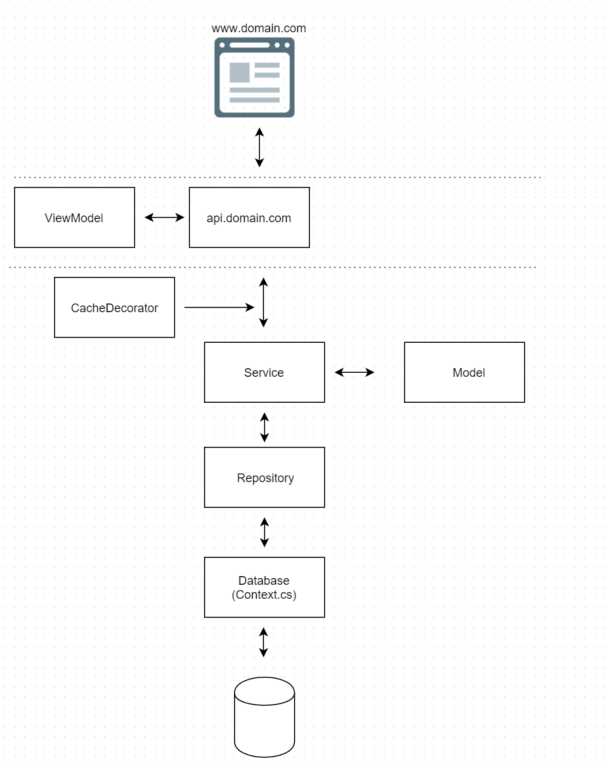 I would like to hear how to scale this into a "proper architecture" with API, repository that handles caching and so forth probably. Note: I am not looking for a discussion (which isn't meant to happen on this site), but just how this is usually solved. So in practice our website uses the Service, Model and Database assembly. 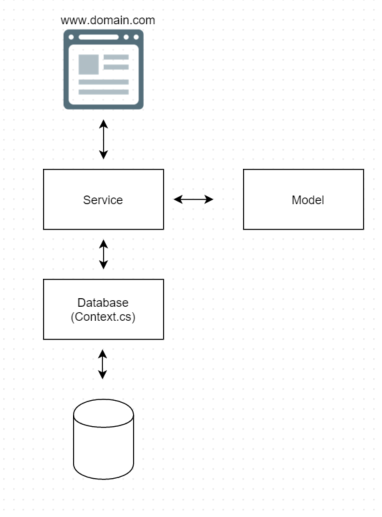 The service returns our Model objects, which it retrieves from direct use on Context.cs. So in practice we could for instance call CustomerService in Service project, which derives from ICustomerService from Model project. This would call Context in Database project directly, which then return a Customer object from Model project. Impossible to easily use a new caching, database or similar. The service layer would let Repository handle all database activity. Does this architecture even make remotely sense? Which objects would be injected where? Would a service inject repository so a CustomerRepository that derives from a IRepository? How is the caching actually done / called? Where can I find some examples about this that will help me? It seems reasonable to me. You've correctly identified the layers you need and what behaviour belongs in each of them. I'm pretty sure you're talking about dependency injection? If so, yes, the service layer would inject the repo layer, and the api layer would inject the service layer. Pretty much every dependency to something doing business logic for the system should be injected, so that you can unit test. I'd suggest starting off with a direct database cache if you don't already have one, and then possibly adding a higher-level cache if you still have demonstrated performance issues in production. If your API is RESTful, you could go a step farther and use a caching proxy such as squid in conjunction with properly set caching headers. The convenience of this will depend on your stack - NHibernate has L2 caching support built in, for instance. Yup. The tradeoff is more time for more flexibility. In addition to the attachment issue you saw, a single representation tied to all three layers may be very limiting later on. For instance, you can't decide to have your API release a single resource that's a combination of two or more database tables. Any change to the representation will impact the whole application, which may not be desirable. You may also find, over time, that layer-specific information creeps into your representation, which will add dependencies that really don't belong in the other layers. Out of scope. :-( Google is your friend? Try something like .net n-tier example. Alternately, if you prefer real code, you could troll github and see if there's anything on there to work off of. Not the answer you're looking for? Browse other questions tagged architecture .net api asp.net-mvc repository or ask your own question. Should a repository transform data into the correct model?